I am a fully qualified Saddler and Harness Maker and have been making riding saddlery since 1999. In general I prefer to make minature real bridlework for my rocking horses because I don't like nailing straps into their heads. However some restoration work requires nail-on tack and for these rocking horses careful copies of the original saddlery can be made. For new work, top quality riding standard leather and fittings are used to give a finish that is satisfying to a horseman or horsewoman. Standard bridlework is hand stitched at 11 stitches per inch, fine work is at 14 per inch. No rivets are used. Strap edges are bevelled, stained, polished and creased (a crease is the thin line running parallel to the edge which gives the straps a finished look). For restoration work, old or aged leather is used make an old looking set of tack. Also it is often possible to repair original tack with matching old leather. Bridles are removable and can be stripped down like a full-size bridle. 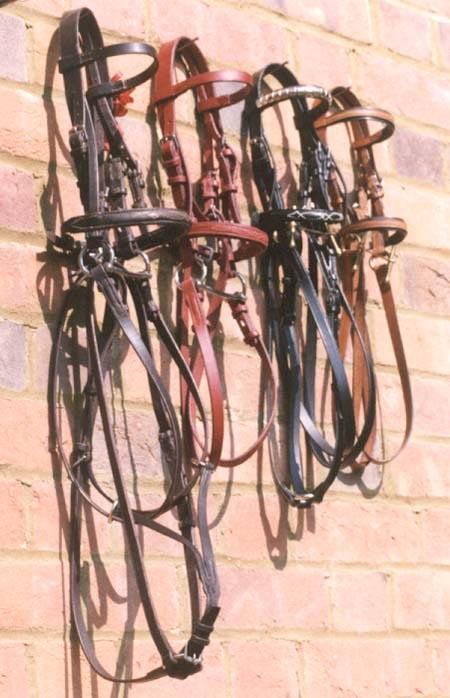 Different style saddles, martingales, nosebands, reins, girths etc. are available. I can make tack for your own rocking horse. This work is quite time consuming because every rocking horse head is different in all its dimensions. Each browband, headpiece, cheekpiece etc has to be measured and cut individually, so this tack costs more than nail-on tack .